Home » All Forums » [Regional Forums] » Eat and Greets - Roadfood Get-togethers » Thread Closed. Go somewhere else. Helpful ReplyHot!Thread Closed. Go somewhere else. The SPAM museum is up that way isn't it? It's about 50 miles south of MSP, closer to Albert Lea, MN. Too bad. That would have been a fun and easy non-food (yes, I chose my words carefully) stop if it were closer. I am preparing for an early arrival so as to visit this historic site. BTW...I am available most dates with the exception of Christmas, Valentine's Day, Paczki Day and my birthday....hoping I still clear the 80% rule! 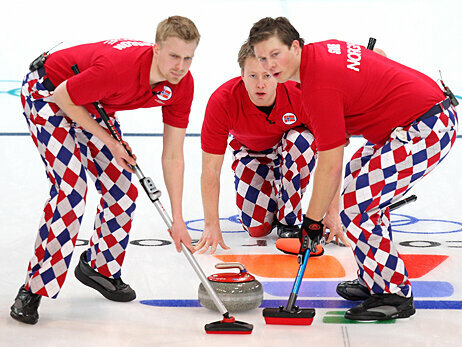 Boyd...let's get matching Curling outfits! I am all in on this! Somehow this sounds like the plot of an upcoming Will Farrell /Ben Stiller movie. How many days prior to the Crawl are you going to spend in Stockholm at the Pie Shop? It might be a doable activity for those who arrive early. Are the towns of Alvin Lea and Arthur Lea located nearby? The Spam Museum is in Austin, not Albert Lea. Albert Lea is about 20 miles west of Austin. Austin is 100 miles south of Minneapolis. More or less what I said, just off by 50 miles. Not horrible for eyeballing it though. Wow, we're more different than I thought. Is that a Euro symbol in your curse word stand-in? I just bought a new keyboard, and I'm pretty sure I ain't got one of those. Hedging my bets and sucking up to the Euros. A whole new look for Beefcake1 at the Boy Dance Party. Has anyone tried these? I'm curious if they work. The last weekend is Memorial Day, which is a non-starter for us as well. I'd like a little warmer weather too but timing-wise for us, the weekend of May 18 isn't good for us either. I'm not sure, how badly broken am I? After Nashville, I think we need to see what major events are going on in MSP the weekends in question before we vote. ...There are many colleges and universities in the Twin Cities. They aren't "college towns" as such, but the dates of commencement can affect hotel availability in the cities proper -- less of an issue in the suburbs. Keep that in mind as you're looking at May dates. Commencement for my department here at the University of Minnesota is usually on Mother's Day. Already called UM (graduation on 5/11), and next week will call University of St. Thomas, Macalester College, and Hamline University. FWIW, Easter hits on 4/21, Passover is 4/19-27 (only the first couple nights matter), and Mother's Day is on the 12th. So far, the most viable long weekends (Thursday-Sunday) are 4/11-14, 4/25-28, 5/2-5, 5/16-19, and 5/23-26. After that, we're into June. I'll also call the local chambers of commerce and ask about major events for those weekends. You are a RoadFooding machine!!! Boy, you sure don't run into those problems with Cleveland or Gahanna. You probably don't run into 'em in Pittston either. I'm willing to take the reins somewhat on the choice of date. I've already mentioned we have a commitment on April 20. If we had to choose, we'd pick the crawl, but I'd rather it not be that weekend. Other than Pie Diva, who would be out for May 16-19, who would be out for sure for any of the weekends? Yeah, I wasn't considering Memorial Day weekend an option. My job would never let me off for those days anyway. I didn't realize that we were considering the weekend of Easter and Passover. You're right, David. Easter is April 21. Passover April 19 - 27. Also, the Twin Cities Susan Komen Race for the Cure is on a weekend in May. Around 40,000 runners. They have not set the date but it's usually on Mothers' Day. Already discussed in post #79. Folks, I know we're all really excited about the next Crawl, but it's still a minimum of ten months away. The whole point of choosing the city before the date was to then look into potential conflicts during all weekends under consideration. The closer we get to the actual dates in question, the more likely we are to get accurate answers. IIRC, in years past, the earliest anyone needed to have a firm date, for vacation request purposes, was the end of August. Is this still the case, or does anyone need to nail this down immediately? The last weekend in April is always out for me.